By GreenEyedLillies on December 13th, 2008 . Filed under: Accessories, Kids . Our Lil Goody Bags are a perfect treat for the sweet little girl in your life! Each bag is custom made and features an embroidered goody of your choice (cupcake, cookie, or ice cream cone) and the child’s name. 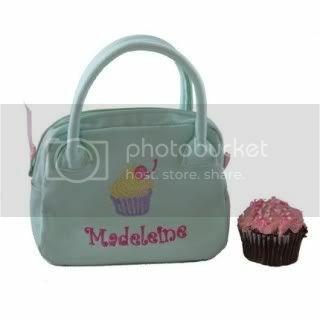 The bags are lined with scrumptious petit fours fabric. They measure approximately 6.5 x 5.5 inches and have a zippered opening.